A cow, which fell 20ft from a cliff in Pembrokeshire, has been helped to safety by a sea rescue team. The animal spent Tuesday night trapped in a rocky bay off Giltar Point at the end of south beach at Tenby. 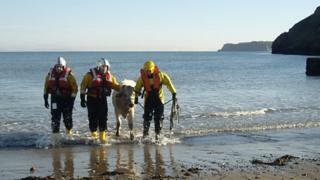 Coastguard and RNLI teams coaxed the cow into the sea when the tide came in at lunchtime on Wednesday. The animal was then able to swim, guided by the Tenby inshore rescue boat, a short distance to the beach. "We are on neap tides at the moment and there was enough space for the animal too remain there safely overnight," explained coastguard Dave Millar. "The farmer put some feed down with it, to keep it going through the night." The coastguard said the animal had been viewed by an RSPCA inspector on Tuesday, after being spotted stranded at around 15.00 GMT. The animal appears to have suffered a slight cut to a leg, after tumbling down a 20ft (6m) drop while grazing on the cliff edge. BBC Wales reporter Sarah Moore said: "Cows can swim, but the tricky bit was always going to be getting it into the sea, especially because the bay it was trapped in was very rocky, and not easy for a hooved animal to manoeuvre. "Luckily this was a placid cow - it was a breed called a "charolais", a small whiteish grey cow - which had been hand-reared so was used to being handled." Before the rescue, Mr Millar said: "What we are hoping to do is to involve the inshore lifeboat from Tenby, the Tenby RNLI to put a halter on the beast and then lead it to the water. "Cows can swim, and we are going to hold the halter... and then tow it back to the beach at Tenby. "It's quite a short swim - it'll be a couple of hundred yards. I know in the past that they have swum cows from Caldey Island to the mainland." The cow was being kept in the warm for a few days while it recovered from its ordeal.